Ashampoo WinOptimizer 8 merupakan Software untuk mempertahankan dan mengoptimalkan Windows. Dapat membuat Program instalasi Windows Anda bebas dari sampah yang tidak perlu ,Membersihkan dan mengoptimasi registry, membersihkan File Internet sehingga Windows dapat berjalan lebih lancar, dan Masih Banyak Fitur lainnya.Pada WinOptimizer 8 sudah ada Lebih dari 100 perbaikan dari WinOptimizer 7. Defrag 3: Defragmentation of hard drives (pro-active defragmentation and boot-time defrag). System Information: Comprehensive and clear information on installed hardware and software (operating system, processor, chip set, drives, etc.). DiskSpace Explorer: Analysis of file groups, e.g. audio or video files, and information on their space consumption. System Benchmark: The performance of the main memory is determined and the processor is tested. The results can be compared online with the ones of other users. Disk Doctor: Hard drives are checked for errors and faulty files can be restored. Service Manager: Optimization and management of installed services and own rating of services. StartUp Tuner: Management of applications that are launched when Windows® starts. Internet Tuner: Automatic or manual optimization of the system settings for the hardware and bandwidth of the Internet connection. Process Manager: This module gives an overview about all currently running processes. UnInstall Manager: Uninstalls applications and faulty entries successfully. A set of tools to delete and encrypt files and folders as well as to restore and send files. File Wiper: Irrevocable and safe deletion of files and folders. File Encrypter & Decrypter: Encrypt and decrypt files. File Splitter & Joiner:Splits a file into several small ones, in order to, for example, send them by e-mail and merge them again afterwards. Tweaking: The access to a lot of hidden system settings enables a detailed customization of the system and frequently used applications. AntiSpy: Adjustment of interfaces and hidden options in Windows®, in order to disable undesired data transmission. File Associator: Management of installed data formats as well as repairing or deletion of faulty data formats. Context Menu Manager: Manages context menus of the Windows explorer and helps with the adjustment to individual requirements. Icon Saver: Saves the icon positions on the desktop and restores them, if necessary. Backup Management: Management of existing backups. Tuning Assistant: Helps new users to optimize their system. Task planner: Planning of tasks and their automatic execution at an appointed time. Settings: Settings for this software and single modules can be adjusted. Disitusnya untuk mendapatkan yang Full Version anda harus membayar sebesar $49.99. Tapi Di InternetTeknologi.Com anda akan mendapatkan secara Gratis. 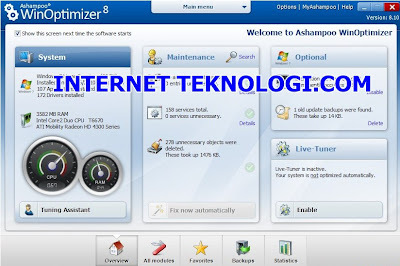 Silahkan Download Ashampoo ® WinOptimizer 8 Version 8.10 Rilisan 27 Juli 2011 Trial Disini,Lalu Install sampai selesai. Klik Double pada Registry diatas,sampai muncul pesan sukses seperti berikut. Jika ada Browser yang masih terbuka akan muncul pesan untuk menutup Browser,seperti berikut. Keluarkan dulu Browser anda,karna Ashampoo ® WinOptimizer 8 akan membersihkan File/sampah yang tidak digunakan. Silahkan Explore Fitur Utilities lainnya ,klik pada Main Menu bagian atas. 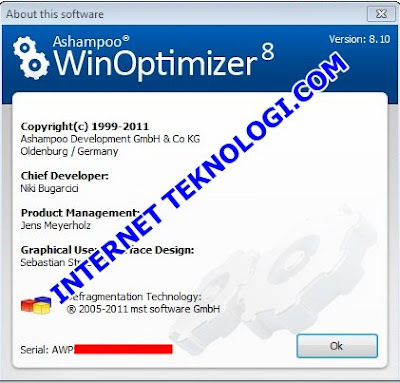 4 orang berkomentar on "Download Ashampoo ® WinOptimizer 8 Version 8.10 Terbaru Full Version Rilisan 27 Juli 2011"
saat ini saya memakai win xp manager apakah bisa digabungin dgn win optimizer 8 atau pilih salah satu & kl pilih salah satu baiknya pk yg mana GAN mohon sarannya, thank's.